The Ape Man is a black and white movie from 1943. Bela Lugosi stars as slightly mad—and more than slightly hairy—scientist, Dr. James Brewster, who has opted to be the guinea pig in his own experiments. Brewster has been conducting research into the link between humans and primates and has injected himself with a serum that may not have aided him in finding the missing link, but certainly seems to be turning him into it! He is a hairy dude, who walks with a stoop, and does everthing but trail his knuckles along the floor. The doctor is a changed man and he is not happy about it. Fortunately he is still man enough to know what the answer is: human spinal fluid. Brewster believes that a good old dose of someone else’s spinal fluid, injected into his own spinal column, will take away his animal urges once and for all. There is a problem though (isn’t there always?) Brewster’s associate, Dr George Randall, refuses to help him because the removal of the fluid would be fatal to the donor. When Randall refuses to help, Brewster goes bananas and, aided and abetted by his trusty sidekick the laboratory gorilla, he goes on a killing spree and collects the much needed fluid. There are some mildly amusing scenes in The Ape Man, like, for instance, Brewster’s first attempt to reverse the changes within him. He forces the unwilling Randall to administer the injection, which Randall does under the watchful eye of Brewster’s gun-toting sister Agatha. After the injection, Brewster stands up and proceeds to parade around the room jerking up and down in an attempt to straighten up his posture, while his gorilla watches, fascinated, from its cage, and mimics his every action. It’s a not side-splitting scene, but it is funny. 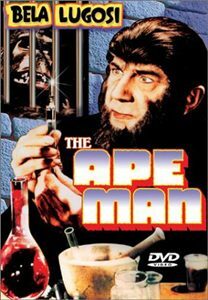 Overall, I would have to say that The Ape Man is not a particularly good movie. It is probably a must-see for all Lugosi fans, but it will probably leave most viewers cold. With a runtime of a little over an hour though, the moive does not last long enough to ever enter the realms of being truly annoying.